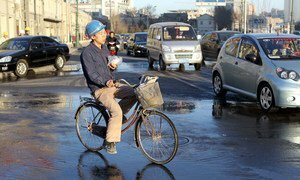 A migrant worker on his bicycle in Tianjin, China. Migrants from countries across Asia and the Pacific play a key role by helping to drive economic growth in their countries of destination while also supporting families in their countries of origin, but the benefits of migration remain under-acknowledged, a new United Nations report has found. Launching the report today at the Foreign Correspondent's Club of Thailand, Hongjoo Hahm, Deputy Executive Secretary of the UN Economic Social Commission for Asia and the Pacific (ESCAP), emphasized that the scale of migration is only likely to increase in Asia and the Pacific, but that the outcome of the trend is in the hands of the region's countries. Mr. Hahm launched the 'Asia-Pacific Migration Report 2015: Migrants' Contributions to Development' on behalf of the Asia-Pacific Regional Thematic Working Group on International Migration, including Human Trafficking, which includes 15 members from the UN system and the International Organization for Migration (IOM). Drawing on evidence gathered from across the region, the report found that more than 95 million people from countries in the Asia-Pacific region live outside their countries of birth, and that the region hosts more than 59 million migrants. The majority of these migrants are temporary migrant workers. The Asia-Pacific region also hosts more than 5.5 million refugees, and three of the main refugee-hosting countries in the world are in the region, according to the report. Among the report's conclusions is that many migrant workers not only benefit from their migration, but also contribute to the development of their countries of origin and destination through their work and the remittances they send home. Migrants also face hardships and abuse, however, so action needs to be taken to maximize these benefits by ensuring that migration is orderly, safe, regular and responsible, the report found. Too often, prejudice against migration and unilateral approaches guide responses to migration challenges. Thus, rather than making migration policies that are aligned with national development priorities and promote conditions of dignity and respect for the rights of migrant workers, many countries place restrictions not only on the entry of migrants into the country, but also on their rights and their ability to access social protection, according to the report. The report also provides guidance on the steps that countries, regional organizations, civil society actors and others can take to improve positive impacts, notably through securing the rights of migrants and ensuring their access to social protection and decent work, both through national policies and multilateral dialogue and cooperation. The Regional Thematic Working Group is currently co-chaired by ESCAP and IOM. A new statistical study conducted by the United Nations International Labour Organization (ILO) has revealed that migrant workers account for 150.3 million of the world’s approximately 232 million international migrants, which amounts to a total of 72.7 per cent of working age migrant population.